If you are considering design ideas of the kitchen in your new house or remodeling your existing kitchen, then you obviously have much in your mind for kitchen floors. Instead of going for other options, you can consider concrete tile flooring in kitchen. A concrete tile in kitchen will be able to provide you better effectiveness as compared to other floor tile options. As compared to regular ceramic tiles, concrete tiles have better durability. 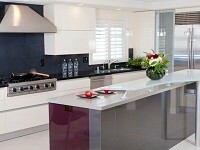 A kitchen is almost always in use and tiles will be exposed to heat and water. This can cause tiles to suffer from wear and tear. However, concrete tiles have better resistance against such wear and tear. Hence, they last longer. A kitchen is a place, where water and moisture will be in abundance. Water can cause lots of damage to the kitchen floors if you don’t select a smarter option. Concrete tile is a smarter option for Kitchen floors, if you want better water resistance. Concrete tile kitchen floors will allow you to have more freedom when it comes to designing. You are not limited to using the square tiles only. You can opt for multiple cutouts, imprinted patterns and more to add a touch of character to the kitchen aesthetic. Concrete tile can have a better color palette in kitchen floors. Other tile options like vinyl and ceramic can limit you to certain color options. With concrete tiles, you can customize your very own blend. This allows you to create décor for your kitchen according to your choice. Moreover, if you already have a stable décor and are just adding new kitchen floors, then it will become easier to make the décor match. Kitchen floors need to be mopped every day due to the high amount of activity. Therefore, you will definitely want a floor tile that can be cleaned easily every day without hassle. Concrete tile kitchen floors are quite easier to clean. Mopping does not require hard effort. Moreover, you can use neutral cleaners to maintain the polish and shine of the concrete floors. In fact, it is recommended to mix neutral cleaners with water and use clean mops every time. This ensures that dust does not stick. 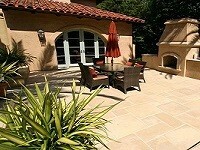 On the other hand, you can clean the concrete tile as easily. Soft cloth, preferably microfiber, is great for cleaning them. Concrete tile floors not only offer immense options for décor but are great for green living. They are hand crafted requiring no heat. Moreover, they are manufactured using natural materials. They are free of lead and harmful synthetic materials. This is quite healthy as you prepare food in your kitchen. You can easily add new kitchen tile floors without breaking the limits of your budget using concrete tile. Other tile options do come at affordable rates but you will often have to compromise on the quality. There is no such condition for concrete tiles. You get multiple benefits including consistent quality without spending too much money. Westside Tile and Stone are offering concrete floor tiles for beautiful kitchen floors. The tiles are available at market competitive rates. This service is available in Southern California including Los Angeles. The concrete tiles are best options for these regions given the combination of aesthetic and durability.